Do you work at RAW at La Suite West? What did you think of RAW at La Suite West? Innovation, pushing the boundaries and great tasting food is the name of the game at RAW at La Suite West, London’s newest fine-dining raw food restaurant. RAW at La Suite West impresses from the outset. 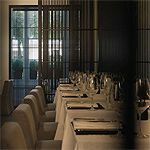 The restaurant of a new boutique hotel, it is located on the ground floor, past the swanky hotel reception. After leaving your coat, you will be ushered into an elegant, streamlined room, with rows of small tables against the walls, wood partitions and nothing else. The colours dominating are black and white and, if it wasn’t for the hotel guests passing in the corridor, there would be hardly any visual or aural distractions during your dining experience. The service is exquisite and what you would expect from a high-end hotel. The staff are deferential and informative, but they can be very helpful; ask about the kitchen, the methods, the philosophy and you will get chatting, receiving interesting insights and recommendations as you go along. Even if there are only a few guests, you aren’t likely to spend the night listening to other people’s conversations, but without doubt, the restaurant shines when it’s full, which will be as soon as the word spreads. The clean design highlights that RAW is a temple of purity. The food is mostly but not exclusively raw – nothing is heated above 42 degrees, the temperature at which precious enzymes perish. The restaurant produces a wonderful, truly innovative seasonal menu that screams of freshness. After you have ordered, you will be brought a plate with bread, olive oil and a clay pot with some plants in it; this is fully edible and wonderfully theatrical. Baby carrots and sweet radishes are dipped into an intangible tarragon mousse and topped with edible earth. This is a delicious way to start your meal and it’s indicative of the ingenious presentation that’s to come. Of all the starters (£6-9), a highlight is the shiitake maki sushi, which substitutes rice with radish and comes served with beetroot wasabi and beetroot-infused ginger; the consistency is creamy and the flavour full. The courgette rolls stuffed with sunflower and sesame seeds uses more common techniques and, being less daunting, does well to convince those who are the most sceptical to the flavour potential of vegetables. Within the mains (£10-11), the mushroom and quinoa burger will sweep you away. The heavy bread is made with sweet potato and the crumbly burger is smoky thanks to the barbecue sauce and nutty because of whole cashews. The daikon ravioli is a more experimental dish. Thin disks of marinated daikon root enclose an almond and date filling and come served on a light pesto made of carrot and basil. Daikon can be really strong, but this dish is gentle to the palate with sweet elements. The desserts (£5-8) are no less stunning. The crispy halva is made with crushed sesame, dipped in dark chocolate and served with a smooth sesame sorbet. The orange and chocolate cheese cake has the traditional texture but it is incredibly fresh, sweet and smooth. On the whole, the menu is startlingly affordable, providing a remarkable experience at a very modest price. Unsurprisingly at RAW, there is hardly any alcohol featured. Instead, you can indulge in a long list of teas, smoothies and mocktails (from £3). The selection of the latter is very extensive and flavours are bold and complement the food well. The Virgin Mojito is very sharp and tangy, while the fizzy Thor is gingery but sweet. RAW is a must-try for all foodies. RAW goes several steps further than most restaurants, using different pairings, concepts and techniques to achieve a sumptuous menu made exclusively of humble vegetables.